Beachcomber's Cottage is a fabulous apartment idyllically overlooking Whitsand Bay, near the Cornish village of Millbrook. Enjoying a stunning beachfront location, this is a unique spot to take your loved one for a break away from it all. Stroll down the cliff towards your home-from-home, the owner will transfer your luggage using his remarkable homemade mechanism. For some relaxing time, take a seat in the homely sitting room, touched with fabulous seaside features and enjoying glimpses of the sea. The charming kitchen benefits from refreshing features and colourful wall tiles. The property offers a beautiful, blue double bedroom in-keeping with this wonderful location, serviced by an equally stunning shower room to get yourself ready in. Relish this outstanding location by taking a seat on the decking and soaking it all in, alternatively take a stroll along the beach right on your doorstep. The charming village of Millbrook sits close by and offers a selection of shops and pubs to set you up for your break. For a busier day trip, head to the port city of Plymouth, featuring fine architecture and a splendid range of amenities and activities. 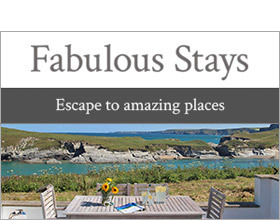 An ideal spot to base a Cornish seaside break for two.